GA: I believe that i have never circulated the following article. It was published originally in March 2012. It is very well written and genuinely presents the arguments against me and in favour of my work. Evidently, the call for ‘my disavowal’ was never taken seriously by anyone out of the pro Palestinian Jewish ghetto and had zero impact on my career and activity. However, I admit, it is exiting for me to see that just two years after the call to 'ignore my thoughts', every thinking being involved with Palestine accepts now that Jewish culture, identity and supremacy are t the core of any issues to do with the Jewish State and its Jewish lobby. This book is now endorsed very widely by a lot of people, a lot of Muslims and Muslim converts wrote about it, like the one I have in mind at the moment is Kevin Barrett who wrote, this is the most important text — he is definitely not a Jew, he is a Muslim — he said this is a very important text for me about identity politics. It teaches me how to drift away from this whole restricting discourse into a society where we can celebrate who we are without falling into a kind of methodical discourse that tells us who we should be or what we ought to be. This merits repetition and reflection: people who know who they are, don’t need identity. And the converse is also true: people who cling to an identity, don’t know who they are. For some people, these philosophical observation are not of the slightest interest when articulated by Atzmon for the simple reason that he has been labelled an antisemite. Thus, for someone like Alan Dershowitz, Atzmon is beneath contempt. Instead, Dershowitz shamelessly directs his venom at anyone in a position of influence who dares to suggest that Atzmon’s ideas are worth reflecting upon. Atzmon is unphased, but he isn’t just getting attacked by Zionists. 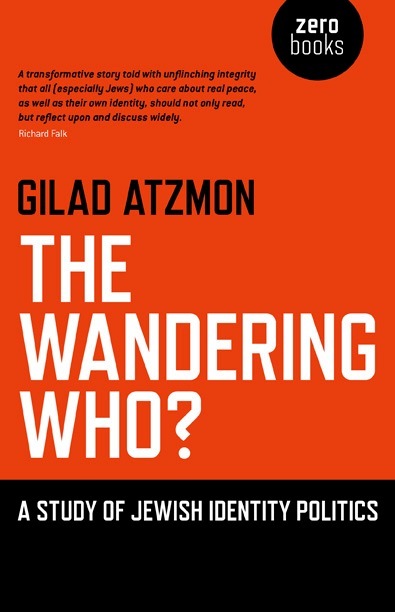 “Not only has my latest book, The Wandering Who?, rocked the boat, but it also has managed to unite Alan Dershowitz and Abe Foxman with Ali Abunimah and Max Blumenthal. That is pretty encouraging: it means that peace may prevail after all.” — Gilad Atzmon, March 14, 2012. This statement — part of an open letter titled “Granting No Quarter: A Call for the Disavowal of the Racism and Antisemitism of Gilad Atzmon” — was preceded by a similar denunciation, “Not Quite ‘Ordinary Human Beings’ — Anti-imperialism and the anti-humanist rhetoric of Gilad Atzmon,” written by “some North American anti-imperialists,” and signed by a large number of representatives of the Palestinian solidarity movement. What is clear is that Atzmon offends, antagonizes and is felt as threatening by a number of anti-Zionists. The group of Palestinian activists who I facetiously labelled the Emergency Committee for Palestine are making a show of solidarity with fellow anti-Zionists. Their move might be well-intentioned, but at the same time it is by its nature, presumptuous, patronizing and authoritarian. What should follow this disavowal? Should there be a book-burning event in order to protect the minds of those of us who might be so imprudent as to show some curiosity about Atzmon’s ideas? Statements of disavowal and denunciation, the picketing of Atzmon’s lectures, and a campaign to persuade others not to provide Atzmon with a platform — if this is not an effort at censorship, what would be involved in actually trying to silence Atzmon? In reality, this is clumsy neo-McCarthyism. It deserves no more respect than the pronouncements of Zionists like Dershowitz who as much as he might profess a belief in the value of free speech will do whatever he can to silence those he opposes. A year ago, Rabbi Michael Lerner, who had heard the criticisms leveled at Atzmon, did something that few of these critics have the courage to do: he invited the-man-who-should-be-shunned into his home and engaged him in conversation. Unfortunately, it doesn’t appear that the whole discussion has been put online, but here’s a snippet that is worth watching — unless of course one wants to follow the advice of the disavowalists. He says this in full awareness that many of his critics prefer to rely on the judgements of others rather than engage in their own inquiry. This has led to an absurd situation: Atzmon’s lectures are being picketed by individuals who when confronted by him admit that they have not actually read his work, but instead merely rely on damning quotes, cherry-picked by anti-Atzmon activists who seem to welcome neither free speech nor free inquiry. Free speech is not some fatuous liberty like being able to shop on EBay or dye your hair purple. The reason we have free speech is because in a society governed by the people, no one can be allowed the privilege or assume the power of becoming the guardians of thought. Those who try to limit the free exchange of ideas have a casual and dangerous disregard for the value of political freedom. No one is being forced to consider what Atzmon has to say — but neither should anyone try and coerce others to refrain from pursuing such an interest. There is something frankly moronic about any political culture where individuals are encouraged to swallow or reject ideas simply because of the reputation of the source. This is an insult to human intelligence and an invitation to intellectual idleness. For those with an interest in the dangerous activity of thinking — and in defiance of those who pronounce I should not be providing such a platform — here is a panel discussion on “Jewish identity politics” in which Atzmon was joined last fall by Irving Rappaport (moderator), Glenn Bowman (social anthropologist, University of Kent), Oren Ben-Dor (Reader in the Philosophy of Law, University of Southampton — who remains silent for reasons unknown), and Karl Sabbagh (author, journalist and television producer). The discussion, followed by questions, runs for one hour forty minutes, divided into ten parts. It’s well worth watching from beginning to end.